Example of an analogy: Grass is to green as sky is to blue. 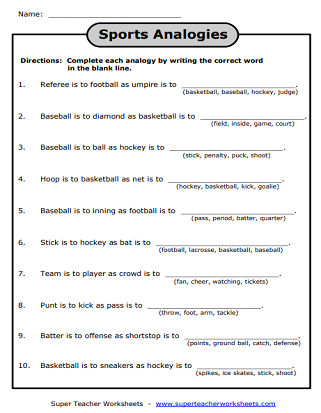 These analogy worksheets will help your students learn to identify word relationships and build vocabulary. 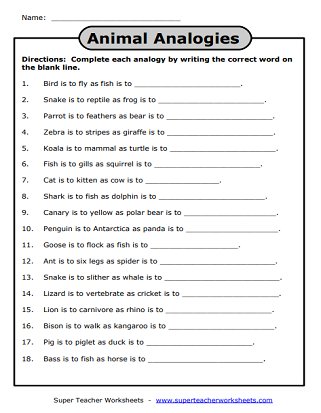 Kids will love the animal analogy puzzles on this worksheet. example: Bird is to fly as fish is to swim. Complete each analogy by writing the correct word on the blank line. Choose the correct word to complete each of these analogies. Then, tell whether the pairs or words are synonyms or antonyms. Choose the correct analogy to complete each sentence. Also, tell why you chose each word. Solve these fun sports analogies. example: Baseball is to diamond as basketball is to court. The site's most popular page-- grammar worksheets-- features worksheets on nouns, verbs, adjectives, punctuation, sentences, and more!